In its Weekly Report On Israeli Human Rights Violations in the Occupied Palestinian Territories for the week of 04– 10 April 2019, Israeli forces continued systematic crimes in the occupied Palestinian territories. 115 civilians, including 28 children, 5 women and 3 journalists, were wounded. The injury of 2 of them was reported serious. 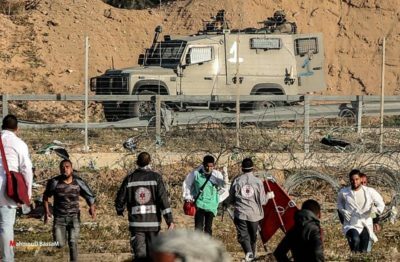 4 Palestinian civilians, including 2 children, were wounded in the West Bank.